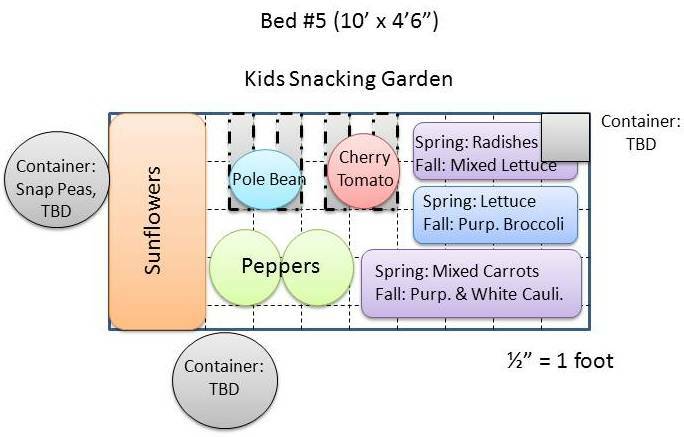 The raised bed that is closest to the outdoor classroom area is the one that has 2 square sections that are a second tier. 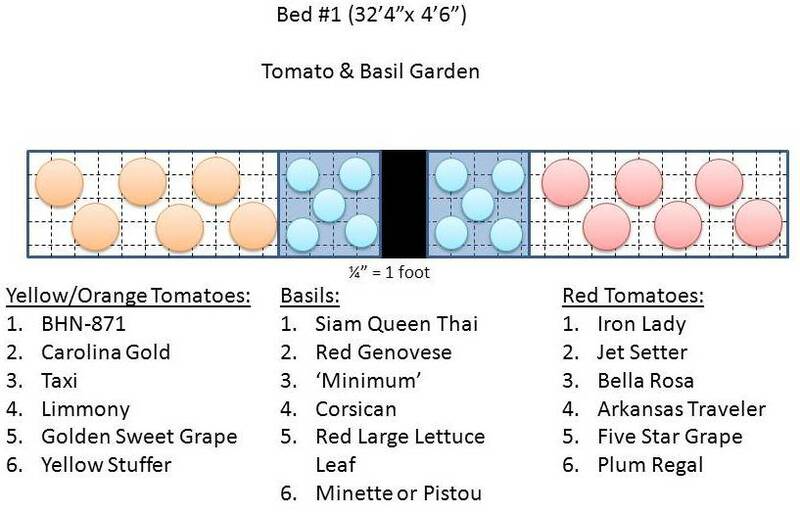 Because of where we had tomatoes last year and the garlic and shallots in Beds 2 and 3, we had no choice but to put tomatoes in that bed, fondly known as “Bed 1.” However, with those raised tiers, we decided to put some basil in those sections, with tomatoes on either end. The tomatoes will be half yellow/orange/gold varieties and half red varieties. This is going to be fun! In both groups of tomatoes we have 3 average slicing tomatoes, 1 heirloom, 1 grape, and 1 random other tomato. Here’s a little information about each variety. BHN-871: We tried to plant this one a few years ago, but I could only find seeds in volumes of 2,000 or more. Yeah, not so much. This year I can get a packet! Hurray! 10-12 oz. fruit, disease resistant, low acid, determinate. 74 days. Carolina Gold: This has been on the K-State Recommended List for a long time, probably because there haven’t been better options. We thought it was only fair to try it and compare. 8-10 oz. fruit, some disease resistance, determinate. 71 days. Taxi: An early producing variety with smaller fruit. 4-6 oz. fruit, determinate. 64 days. Limmony: Supposedly this Russian heirloom tomato has tangy, lemony flavored fruit? Hmm…. Beefsteak type tomato, up to 1 lb. fruit. Indeterminate, 80 days. Golden Sweet Grape: Yellow grape tomato, mild flavor, crack resistant. Indeterminate. 60 days. Yellow Stuffer: This is obviously the “random” variety. The tomato fruits are shaped like bell peppers and are hollow like peppers, so you can make stuffed tomatoes! Indeterminate. 76 days. Iron Lady: This is a new variety that I mentioned on the blog awhile back. It is resistant to late blight, early blight, and Septoria leaf spot. It has dense, 5 oz. fruit on determinate plants. 75 days. Jetsetter: This is a slightly earlier version of Jet Star with much more disease resistance. 8 oz fruit, indeterminate. 64 days. Bella Rosa: Another highly disease resistant slicer, this variety claims some heat tolerance as well. 10-12 oz. fruit, determinate. 75 days. Arkansas Traveler: This is an heirloom that I’ve had recommended to me as one that tolerates heat. We’ll see! 6 oz. fruit, indeterminate. 90 days. Five Star Grape: Basic red grape tomato. Crack resistant, indeterminate. 62 days. Plum Regal: A very disease resistant plum/roma tomato, with some Early blight resistance. 3-4 oz. fruit, determinate. 80 days. Basils….I will come back and hit the basils on another day when I talk about all the herbs. I was looking through my Richters Herbs catalog this morning, getting some ideas for the Herb sub-committee meeting, and noticed information about something called “Seed Zoo“. Basically they are working with ethnobotanists to preserve traditional varieties of vegetables found in different parts of the world. This isn’t a new concept, certainly. I’ve been a fan of Native Seed SEARCH for quite a while. They preserve traditional plants and seeds from the desert Southwest. If you visit the Seed Zoo website, they have interesting stories to go with each seed about where they came from. While many of them probably wouldn’t grow well here, I always find it extremely interesting to see the differences in fruits and vegetables grown in different parts of the world. One thing I find interesting is that in the descriptions, a couple of times they say that the particular melon was growing in a very hot humid location, therefore that variety might have some good disease tolerance. I suppose that is possible. It is also possible that some of the diseases we find problematic do not exist in those locations. Like plants, not all diseases naturally exist everywhere. They have to be spread to a new location in one way or another. That’s one reason that there are restrictions on importing plant material into the U.S. When it is cold outside, I often crave foods that are spicy. USDA’s MyPlate recommends that we replace some of our protein 2-3 times a week with seafood, especially fish that is high in omega-3’s like salmon, tuna and mackerel. Eating baked fish can get boring, so this week, lets spice it up with some fresh vegetables and herbs. Add a fresh fruit salad and you have a delicious meal. Did Someone Say Fiesta? Stir together the dressing, lime juice, chili powder, pepper, and jalapeno (if desired). Pour over coleslaw mix and stir to mix well. Cover and place in refrigerator until serving time. Warm the corn tortillas according to package directions. Heat the oil in a small non-stick skillet over medium heat until hot, but not smoking. While the oil heats, spread the cornmeal on a plate. Pat the fish pieces in the cornmeal to coat on all sides. Fry the fish in hot oil until the cornmeal is lightly browned, 1 to 2 minutes per side. Remove and drain on paper towels. Top each tortilla with some of the fish and some of the coleslaw mix. Fold in half and serve with the chopped tomato, if desired.